"Through their guidance and patience we streamlined our systems, upgraded our hardware, revitalised and systemised software, changed our service providers and even moved office. All of this while saving money along the way." If you are a small business owner looking for computer support then it's critical that you get and read this small business advisory. Can you rely on your current IT support company to get your small business back on track in the event of an IT disaster? With Navigatum, you can virtually eliminate business downtime. I understand that dependable technology and business continuity is essential when you’re running a small company. You don’t have time to deal with IT problems or unreliable IT support companies, and when disaster strikes, you need to get your business back on track immediately. 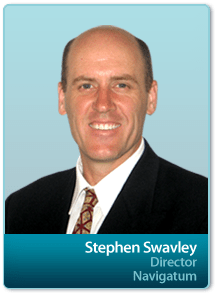 My name is Stephen Swavley and I am the President/CEO of Navigatum. For more than 20 years, we’ve made it our mission to completely eliminate problems with computers and frustrations for small companies like yours throughout Sydney. Give us a call today and one of my senior technicians will contact you immediately to fix your problem. Why Are We Giving Away Free IT Support? Some people think it’s crazy that we’d give away free IT support. They wonder, “Aren’t there people who will just take advantage of you for free support?” Truthfully speaking, some people might – but I know that the majority of our clients just want a company they can trust to handle their IT. That’s why I’m making this offer to you. I know our IT company is hands down the best at what we do, but I don’t think you should have to spend a dime to find that out for yourself. I don’t expect everyone who contacts our company to become a customer, but I do know that some will end up becoming loyal, long-term clients just like the businesses listed on the left side of this page (and even more here – link to the testimonial link on the page). To secure your 2 free hours of technical support, just complete the form above or call me at 1300 664 995 today. Activating your free IT support will take just a few moments – a few moments that could potentially save you a lot of frustration (and money) when you need it most.